A nice little getaway with southern charm located in a nice quiet neighborhood. It has very plush furniture in the living room that you won’t want to get off of. This space also features a roomy backyard with a table top gas fire pit, chairs and Edison lights surrounding for a nice evening. 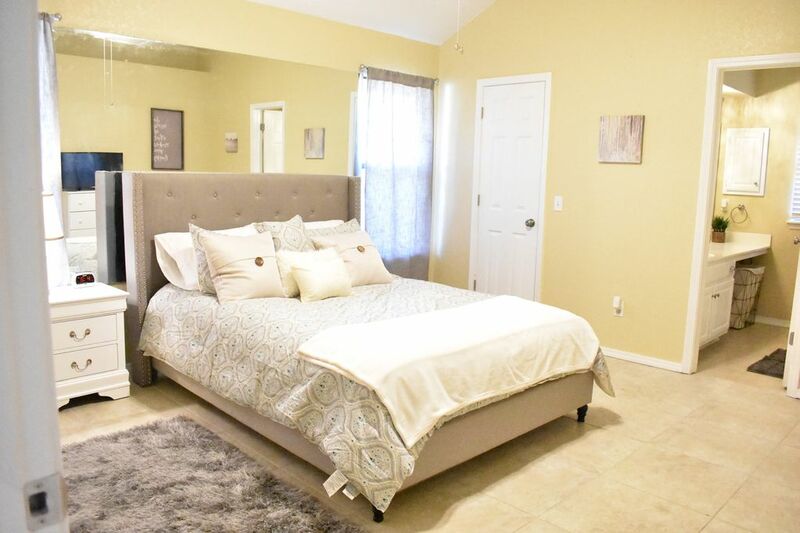 We have pillow top mattresses in the master bedroom and the guest queen bedroom. There are also games in the back perfect for entertaining. So handy to headquarter here for a Spring Break retreat. OKC has lots to do, plenty of eateries, fun shopping. House has TV in each bedroom, comfy beds, spacious bathrooms, quiet neighborhood, easy to work in kitchen, and was sparkling clean. Keypad is on the front door itself so if you arrive after dark and the porch light isn't on, use your flashlight to figure it out. The owner was VERY helpful and quick to respond when we couldn't see the keypad at first and after that it was easy. Great quiet neighborhood and very accessible! Comfortable home. Nice floor plan. Good for getting around NW OKC! very big house, and comfortable, and very, clean, a good chance to rent the house. Great place. Cozy. Nice neighborhood! We absolutely loved the home during our October 2018 stay! The home was in a great location, fully equipped, comfortable, and clean. Brooke was very prompt if we ever needed anything. Whenever we visit Oklahoma again, this will be our HomeAway of choice. My adult children and I thoroughly enjoyed our time here. Brooke was very responsive, the home was clean and comfortable with lots of nice touches. The neighborhood was nice and close to lots of restaurants and shopping. Would definitely stay here again!